Peter Washington, bass; Kenny Washington, Victor Lewis, drums. One of the greatest satisfactions in my line of work has come from observing that magic sequence I sometimes think of as "crossing the line." Occasionally it is swift, but more often it sneaks up gradually but inevitably, as a musician you're working with breaks through the invisible, intangible (but quite real) barrier that distinguishes the merely "promising" from the accepted, the interesting from the important. Calendar age has nothing to do with it: some achieve this status quite early, while others may spend a life-time waiting. Musical maturity is very reievant; the event is best described--if you'll forgive the cliche--as separating the men from the boys. Still in his early 30s, Moore has worked with a dazzling array of leaders: Horace Silver, Roy Haynes, Dizzy Gillespie, Freddie Hubbard, J. J. Johnson--which sounds like (and is) great training, but led one critic to wonder if he weren't destined to be "a sideman for everyone." But that same writer, Peter Watrous, reviewing Ralph's previous Landmark album in Musician magazine, pronounced it "a stunning leap forward" and called him "an individual voice." On the first Sunday in 1990, the Calendar section of the Los Angeles Times devoted a page to five acoustic jazz artists "most likely to have an impact . . . in the coming decade" and included Moore, citing his Landmark debut as "one of the most rewarding and listenable jazz releases in recent memory." Last fall's Phillip Morris-sponsored "Superband" world tour, by an almost entirely veteran orchestra with only three young players, had Ralph as one of two tenors, affording him the honor and pleasure of teaming with all-timer James Moody. When teenage trumpeter Roy Hargrove (who plays an important role on this album) made an early sideman appearance at New York's legendary Village Vanguard, it was in a quintet led by Moore: Roy's management were looking to Ralph as the comparative veteran to introduce the newcomer--an unaccustomed task, but one he might as well get used to. Following these and other examples, it was hardly any kind of surprise when the 1990 critics polls of both Down Beat and JazzTimes magazines agreed on him as tenor saxophone winner in the category known, respectively, as "Talent Deserving Wider Recognition" and "Emerging Talent." No surprise, but a very fitting pair of exclamation points for a sentence such as: Ralph Moore has arrived! A good deal of documentation for all this is to be heard on the seven selections here: the power and imagination, the swiftly-growing command and assurance. Moore has now taken steps to assemble a regular working group of his own, and this could well be its permanent rhythm section (with either drummer). Up to now, he has worked with them as often as possible. When a schedule conflict made Kenny Washington (who had combined superbly with Peter Washington and Benny Green on Ralph's previous Landmark recording) missed the Vanguard week, Victor Lewis had been called in. When Victor was unavailable for the first of these two sessions, Kenny stepped in! There clearly was no problem either way in achieving a fully-meshed unit. On four selections, the addition of Roy Hargrove makes it the familiar post-bop trumpet/tenor frontline, but actually Roy makes it anything but routine. There is much empathy between the two horns, and the younger man has a whole lot to add here. To be strictly accurate, Hargrove can no longer be called a teenager, since he has by now turned 20, but he is very likely to be recognized as part of the great tradition of early-blooming trumpet players. 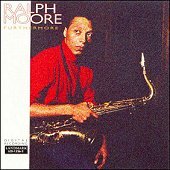 A well-balanced repertoire combines three examples of Ralph's writing with contributions from Hargrove and Green and adds a soulful version of Neal Hefti's "Girl Talk" and an impressive quartet treatment of Thelonious Monk's seldom-attempted "Monk's Dream." Altogether a proper celebration of the solid status of Ralph Moore.